Civil War Heroes Arrive for Re-Enactment Tomorrow. 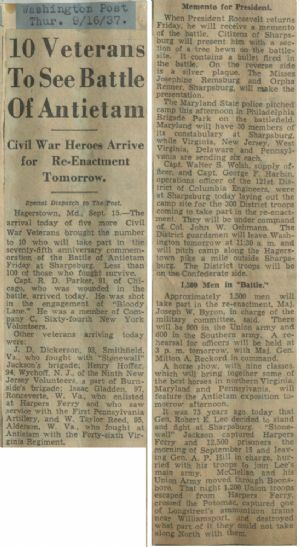 The arrival today of five more Civil War Veterans brought the number to 10 who will take part in the seventy-fifth anniversary commemoration of the Battle of Antietam Friday at Sharpsburg. Less than 100 of those who fought survive. Capt. R. D. Parker, 91, of Chicago, who was wounded in the battle, arrived today. He was shot in the engagement of "Bloody Lane." He was a member of Company C, Sixty-fourth New York Volunteers. Other veterans arriving today were: J. D. Dickerson, 93, Smithfield. Va. who fought with "Stonewall" Jackson's brigade; Henry Hoffer, 94, Wychoff, N. J., of the Ninth New Jersey Volunteers, a part of Burnside's brigade; Isaac Gladden, 97, Ronceverte, W. Va., who enlisted at Harpers Ferry and who saw service with the First Pennsylvania Artillery, and W. Taylor Reed, 95, Alderson, W. Va., who fought at Antietam with the Forty-sixth Virginia Regiment. When President Roosevelt returns Friday, he will receive a memento of the battle. Citizens of Sharpsburg will present him with a section of a tree hewn on the battlefield. It contains a bullet fired in the battle. On the reverse side is a silver plaque. The Misses Josephine Remsburg and Orpha Renner, Sharpsburg, will make the presentation. Capt. Walter S. Welsh, supply officer, and Capt. George F. Harbin, operations officer of the 121st District of Columbia Engineers, were at Sharpsburg today laying out the camp site for the 300 District troops coming to take part in the re-enactment. They will be under command of Col. John W. Oehmann. The District guardsmen will leave Washington tomorrow at 11:30 a. m. and will pitch camp along the Hagerstown pike a mile outside Sharpsburg. The District troops will be on the Confederate side. Approximately 1,500 men will take part in the re-enactment, Maj. Joseph W. Byron, in charge of the military committee, said. There will be 900 in the Union army and 600 in the Southern army. A rehearsal for officers will be held at 3 p. m. tomorrow, with Maj. Gen. Milton A. Reckord in command. A horse show, with nine classes, which will bring together some of the best horses in northern Virginia, Maryland and Pennsylvania, will feature the Antietam exposition to- morrow afternoon. It was 75 years ago today that Gen. Robert E. Lee decided to stand and fight at Sharpsburg. "Stonewall" Jackson captured Harpers Ferry and 12,500 prisoners the morning of September 15 and, leaving Gen. A. P. Hill in charge, hurried with his troops to join Lee's main army. McClellan and his Union Army moved through Boonsboro. That night 1,200 Union troops escaped from Harpers Ferry, crossed the Potomac, captured one of Longstreet’s ammunition trains near Williamsport and destroyed what part they could not take North with them. Copyright 1937, Washingtonpost.Newsweek Interactive and The Washington Post. All rights Reserved.